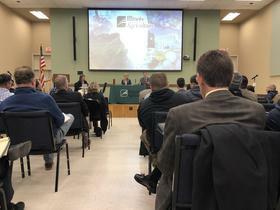 The Illinois Department of Agriculture heard from the public on Tuesday regarding proposed rules for the state's industrial hemp program. The meetng drew a crowd of roughly 100 people, ranging from long-time advocates to small farmers. Twenty people spoke publicly about their concerns and many also offered suggestions for improvement. One issue that a majority spoke about dealt with the certification of seed. Currently, the rules state that all hemp seed must be certified by the Association of Official Seed Certifying Agencies (AOSCA). Farmers who wish to extract CBD oil from the crop said the certified strains do not have high CBD content. "The AOSCA strains that I have access to now would produce 2-3% CBD which I could sell on the market for approximately $20 to $30 per pound of dried material," said John Furlow, who wants to become a hemp producer. "Our neighbors in Kentucky or Oklahoma can grow 10-15% CBD plants. On the same market that could fetch $100 to $150 per pound. I just want to be competitive with everyone else in the country whenever we start this." Another important factor is timing. Will farmers be able to get a crop in the ground this year? The rules state that a farmer must complete and submit an application 90 days before planting, which means planting hemp in the 2019 season is unlikely. "The piece that is most concerning is the 90-day rule that requires farmers to have their applications in 90 days prior to planting," said Kevin Pilarski with Revolution Industrial Hemp. "If June 1st was the ideal day to plant, that would mean a farmer would need to get his application in by March 1st." Many suggested shortening that 90-day window because it could be months until the rules are final. The proposed rules were submitted before Congress passed the 2018 Farm Bill which federally legalized hemp. Jeff Cox, who will oversee licensing and regulation of the program for the IDOA, said he recognized there were some conflicts between federal law and Illinois' proposed rules. "I just want you all to understand that we have the opportunity still to make modifications to our current rules that we have proposed," said Cox. "I hope that sets some minds at ease." The legislation was signed into law by Gov. Bruce Rauner in August of last year. IDOA published the proposed rules on Dec. 28th, 2018. The department will continue to accept public comment until February 11th. After the rules are approved by the legislature’s Joint Committee on Administrative Rules (JCAR), they could be called back for a second public comment period. An IDOA spokesperson said they are unsure whether the U.S. Department of Agriculture will also need to approve the rules before farmers are able to plant the crop.